Posted on 24, June 2016 by EuropaWire PR Editors | This entry was posted in Austria, Construction, Environment, Management, Switzerland and tagged EDGE Green Building, seminar in Africa, SGS, web software. Bookmark the permalink. 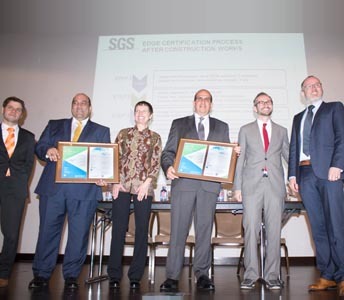 SGS recently hosted a seminar in Africa to introduce the new EDGE web software – a Green Building innovation developed by IFC, a member of the World Bank Group, to certify buildings in emerging markets quickly, easily and affordably. VIENNA, 24-Jun-2016 — /EuropaWire/ — The event took place on Thursday 28th April, 2016 in Hotel Kempinski in Accra, with speakers from thinkstep, IFC and SGS. The seminar was presented by Rebecca Menes and Rusmir Musić from IFC, Thomas Saunders from thinkstep and Benjamin Van der Auwera from SGS. It included a live step-by-step demonstration of the EDGE building platform to illustrate the simplicity of the web tool and how it can promote a faster, more affordable way to design, build and brand resource-efficient buildings. The session also explained the EDGE auditing and certification process performed by thinkstep and SGS. thinkstep presented the advantages of EDGE in comparison to existing schemes, while SGS presented the process, from project design to post-construction certification. Following the presentation, the speakers had the pleasure of presenting two EDGE preliminary certificates to representatives of The Exchange complex – a multi-facetted real-estate development project in Accra. The certificates validated EDGE compliance at the design stage for the residential blocks and the Radisson Blu Hotel, both located in The Exchange complex. The question and answer session following the presentation provided the audience with an opportunity to hear how The Exchange developers felt about their interactions with SGS and thinkstep throughout the validation and certification process. The seminar was followed by a networking reception and dinner with the speakers and delegates. The event proved to be a big success, with 50 participants from various sectors and functions attending the seminar, including hotels, real estate developers, architects, designers, banks, the Green Building Council, and environmental and cooperation agencies.